“White Democrats will desert their party in droves the minute it becomes a black party.” Kevin Phillips, The Emerging Republican Majority, 1969. Reasons for the switch are not so hard to understand. . . . . Southern anger over the Democratic Party’s embrace of civil rights reforms was no secret and no surprise. While the “why” behind the flight of the Dixiecrats is obvious, the “how” is more difficult to establish, shrouded in myths and half-truths. Analysts often explain the great exodus of Southern conservatives from the Democratic Party by referencing the Southern Strategy, a cynical campaign ploy supposedly executed by Richard Nixon in his ’68 and ’72 Presidential campaigns, but that explanation falls flat. Crediting the Nixon campaign with the flight of Southern conservatives from the Democratic Party dismisses the role Southerners themselves played in that transformation. In fact, Republicans had very little organizational infrastructure on the ground in the South before 1980, . . . The flight of the Dixiecrats was ultimately conceived, planned, and executed by Southerners themselves, largely independent of, and sometimes at odds with, existing Republican leadership. It was a move that had less to do with politicos than with pastors. Southern churches, warped by generations of theological evolution necessary to accommodate slavery and segregation, were all too willing to offer their political assistance to a white nationalist program. Southern religious institutions would lead a wave of political activism that helped keep white nationalism alive inside an increasingly unfriendly national climate. Forget about Goldwater, Nixon or Reagan. No one played as much of a role in turning the South red as the leaders of the Southern Baptist Church. There is still today a Southern Baptist Church. More than a century and a half after the Civil War, and decades after the Methodists and Presbyterians reunited with their Yankee neighbors, America’s largest denomination remains defined, right down to the name over the door, by an 1845 split over slavery. So long as pastors or priests (or in this case, televangelists) are willing to apply their theological creativity to serve political demands, religious institutions can be bent to advance any policy goal. With remarkably little prodding, Christian churches in Germany fanned the flames for Hitler. The Southern Baptist Church was organized specifically to protect slavery and white supremacy from the influence of their brethren in the North, a role that has never ceased to distort its identity, beliefs and practices. At that time , there may have been no more influential figure in the Southern Baptist Convention than W.A. Criswell, the pastor of the enormous First Baptist Church in Dallas. Long after the battle over whites’ only bathrooms had been lost, evangelical communities in Houston or Charlotte can continue the war over a “bathroom bill” using a rhetorical structure Criswell and others built. He had constructed a strangely circular, quasi-libertarian argument in which a right to oppress others becomes a fundamental right born of a religious imperative, protected by the First Amendment. Criswell’s bizarre formula, as it metastasized and took hold elsewhere, could allow white nationalists to continue their campaign as a “culture war” long after the battle to protect segregated institutions had been lost. Southern Baptists remained at the vanguard of the fight to preserve Jim Crow until the fight was lost. Evangelical resistance to the civil rights movement was not uniform, but dissent was rare and muted. Southern Baptist superstar Billy Graham was cautiously sympathetic to King. . . . . However, in public Graham was careful to keep a safe distance and avoided the kind of open displays of sympathy for civil rights that might have complicated his career. 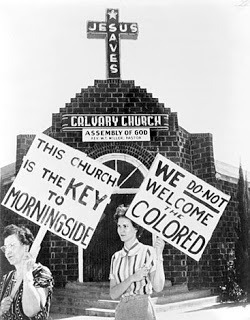 In 1968, the Southern Baptist Convention formally endorsed desegregation. That same year, in a remarkably passive-aggressive counter to their apparent concession on civil rights, they elected W.A. Criswell to lead the denomination. In 1967, Mississippi began offering tuition grants to white students allowing them to attend private segregated schools. A federal court struck down the move two years later, . . . . It was the status of these schools, a growing source of church recruitment and revenue, that finally stirred the grassroots to action. Televangelist Jerry Falwell would unite with a broader group of politically connected conservatives to form the Moral Majority in 1979. His partner in the effort, Paul Weyrich, made clear that it was the schools issue that launched the organization, an emphasis reflected in chain events across the 1980 Presidential campaign. The rise of the religious right is usually credited to abortion activism, but few evangelicals cared about the subject in the 70’s. For decades, men like [Lee] Atwater had been searching for the perfect “abstract” phrasing, a magic political dog whistle that could communicate that “N…r, n…r” message behind a veneer of respectable language. It was religious leaders in the South who solved the puzzle on Republicans’ behalf, converting white angst over lost cultural supremacy into a fresh language of piety and “religious liberty.” Southern conservatives discovered that they could preserve white nationalism through a proxy fight for Christian Nationalism. They came to recognize that a weak, largely empty Republican grassroots structure in the South was ripe for takeover and colonization. . . . Religious nationalists began to purge traditional Republicans from the region’s few GOP institutions. The real fury came when Moore applied to Donald Trump the same standard of conduct Baptists had demanded of Bill Clinton. As religious leaders lined up solidly behind Trump last fall, Moore commented, "The religious right turns out to be the people the religious right warned us about." Today, W.A. Criswell’s Dallas megachurch is pastored by Robert Jeffress, who has remained faithful to the most bigoted strains of the olde tyme religion. Billy Graham’s son, Franklin, retooled the ministry he inherited, turning it into something a civil rights era segregationist could love without reservation. Graham, who earns more than $800,000 a year as the head of his inherited charity, has made anti-Muslim rhetoric a centerpiece of his public profile and ministry. Not surprisingly, a recent survey found that a majority of evangelicals admit to being racists. "Religious liberty" today equates with a right to discriminate against gays but also ultimately to discriminate against blacks, one of the bedrocks of the Southern Baptist Church and its allied evangelical churches. As has been the case through so much of history, organized religion is a pervasive evil. Hopefully, with the flight of younger generations from religion over time its toxic power will die in America. Thanks for including the references to Y.A. Criswell in this piece. For many years, this minister of hate was a leader in bigotry under-recognized by America as a whole. Criswell came to prominence, and eventual presidency, in the Southern Baptist Convention by his explicit acceptance of the use of violence to keep Southern Baptist churches segregated. Rather less known, but also of great importance, was his repeated attacks on the loyalty and patriotism of American Catholics, specifically including that of then-Senator John Fitzgerald Kennedy. It was to respond to these attacks that JFK made his famous redeclaration of America's traditional view of the separation of church and state, a view first established by George Washington whose import prominent Republiscum Catholics today have been seeking to undercut. After the assassination of JFK and the subsequent enactment of the various civil rights laws, Criswell saw fit to fade publicly into the background until he was picked in 1968 to be the public face of an officially reconstructed Southern Baptist Convention. The piece mentions Criswell's acolyte and spiritual and de facto heir, Robert Jeffress, who has succeeded Criswell as pastor of one of America's biggest megachurches. Jeffress, one of the creatures with the greatest influence on Mike Pence and Traitor Chump, is a notorious anti-LGBT bigot. Less well known, but even more important not just to the U.S. but to the world as a whole, is Jeffress' belief in the desirability of a literal Armageddon, a global nuclear war preferably beginning in the Middle East as an essential precursor to the return of Jesus to this earth, and his literal embrace of Degenerate Don -- after all, nobody's perfect -- in his efforts to emulate (my opinion) the Anti-Christ. Jeffress of course is not the only Southern Baptist sociopath inspired by Criswell, and not even the best known. Rick Warren, pastor of the notorious Saddleback Church and author of "The Purpose-Driven Life," credits Criswell for being responsible personally for his "come to Jesus" moment and subsequent inspiration and named his mentor as being probably the greatest preacher of the second half of the 20th Century. Sadly, Criswell's legacy lives on, as his spiritual heirs, lay and spiritual, continue to ask themselves, "What would Jesus do?" And hasten to do the opposite.